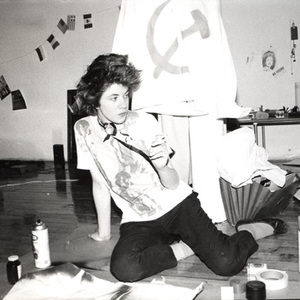 Lizzy Mercier Descloux (1956 - 2004) was a french singer born in Paris. After the modest debut of her group Rosa Yemen, she recorded five albums under her own name between 1979 and 1988. She had her biggest success in 1984 with the song Mais o&ugrave; sont pass&eacute;es les gazelles ("But where have the gazelles gone? "), which announced her interest for South African rhythms and the emergence of Johnny Clegg. After the modest debut of her group Rosa Yemen, she recorded five albums under her own name between 1979 and 1988. She had her biggest success in 1984 with the song Mais o&ugrave; sont pass&eacute;es les gazelles ("But where have the gazelles gone? "), which announced her interest for South African rhythms and the emergence of Johnny Clegg. She designed for the Paris store Harry Cover, temple of the punk movement, with Michel Esteban. She also distinguished herself with her articles about new wave in the magazine Rock News, contributing to the notoriety of Blondie, Patti Smith, and the Talking Heads. After her musical career, she turned towards painting. She died in Saint-Florent in the French d?partement of Haute-Corse from complications of cancer on 20 April 2004 at the age of 47.